These were so much fun to create that I did a bunch of them - really love these colors. This is a 4-1/2 x 4-1/2" square card and just fit nicely. I used a heart die as a stencil and drew with pencil to trace the heart. Next I just wet the inside of the heart with a light layer of water and then pink, leaving some white areas and dried it, building up the pinks in color and layers, drying in between. Once I was happy with it I stamped the sentiment using the MISTI because this is rough watercolor paper and doesn't usually stamp nicely. I die cut a rounded rectangle and painted some pinks I used to make a base layer and mounted it on some black cardstock. I am entering this one into the CASology Week #285 and the HLS Watercolor Challenge. Thank you for reading this and the supplies I used are listed below. This is beautiful. I really love your shading and shadows. Thanks so much for playing along at CASology this week. 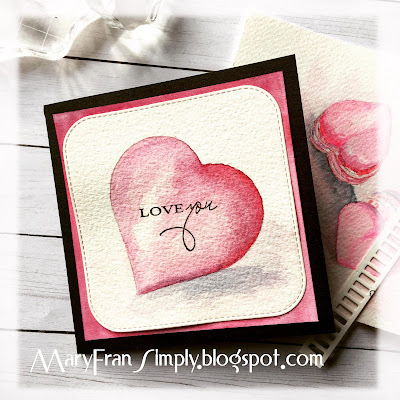 I just love how you have transformed a simple pencil outline of a heart shaped die with your water coloring. Thank you for playing along with us this week at CASology Challenge. Your watercolored heart is stunning! Thanks for sharing with us at CASology this week, Mary! Love the sense of dimension your got with your watercoloring. Beautifully CAS. So happy you could join in the fun at CASology this week.